Michael D.D. White, in his Noticing New York blog, offers a must-read, warning So Many Unchecked Approval Boxes: Why Any Sensible Bond Buyer Should Probably Steer Clear of Buying Atlantic Yards Nets Arena Bonds. Atlantic Yards is a project with many, many moving parts, and the Wall Street Journal has reported major questions about whether the bonds could get crucial insurance, given questions about the arena's revenue-earning potential. We used to oversee the legal aspects of bond issuances for six agencies that were the state’s largest issuers of municipal bonds. This is NOT the kind of show we ran. Far from it. The whole article is well worth a read. 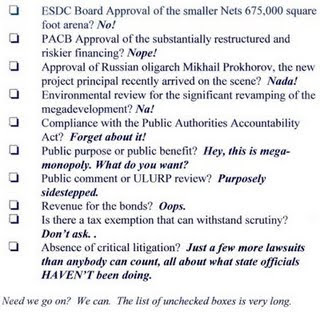 Surely the Empire State Development Corporation (ESDC) has considered and written off most of the concerns in White's checklist, but they don't go away that easily. I'll point to White's observation about the smaller arena the ESDC didn't actually approve, and the questions it raises for the Public Authorities Control Board (PACB), which did not re-approve the state support for the project. The public is getting a lot less for what it is putting into the deal and the current transaction is much more likely to be headed for a default. In the original transaction that the PACB approved, each square foot of arena (850,000 square feet total) had to generate income to support a cost of $749 p/s/f of construction and financing costs ($637.2 million total). In the new transaction, each square foot of arena (675,000 square feet total) now has the much more onerous burden of supporting the cost of $1,378 p/s/f of construction and financing costs ($930 million total). That’s almost double the burden. Doesn’t that sound like a deal that has become much more financially precarious? $700 million would be almost exactly a 10% increase over the originally authorized $637.2 million in bonds. Keeping the bond amount down so that it doesn’t exceed the originally approved amount by 10% could create an argument that a new PACB approval for the revised deal is not required but that argument would carry only if one ignored (the way the ESDC board did) the decrease in the arena size and all the other aspects of the financing deal whereby the public is getting much less for the funds it is putting into the project. It would carry only if one were willing to be completely blind to the escalating risks the transaction is facing. That’s exactly what the PACB is NOT supposed to do. White points to a New York Times Dealbook column (tied to an article) on June 25 which suggested bonds would be issued "possibly in early October," a sale which "bankers say... should go smoothly." Well, whether they sell smoothly or not when issued remains in question, because no bonds have been issued yet. Undoubtedly there are some very busy bankers at Goldman Sachs trying to move the deal before Thanksgiving, there are also some serious clouds--lawsuits that the ESDC does not consider material but which have to give bond buyers and insurers pause or, at least, pose higher interest rates. Great NN article, Norman -- your brand of diligent reporting is spreading. Thanks for the tip. NN notes that Prokhorov is likely part of the deal to ensure if the bond closing happens before the real estate closing, that interest can be issued and/or the risk minimized. What if Prokhorov is actually on board to buy up the bonds? Maybe this is part of his "unspecified future investments"? Even if he's there to buy whatever bonds don't sell on the open market, FCR meets the IRS deadline and saves the $180 million or so. Right? Has that been obvious all along and I'm just now getting it? As always, thanks for the insightful reporting. Given that Prokhorov's investment is no money down, he's not assuming much risk. So I don't think he'd buy the bonds.